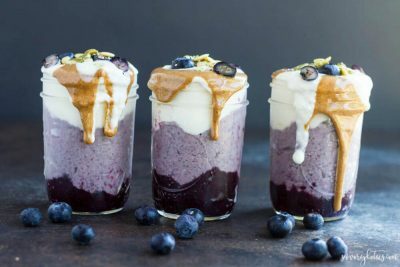 A healthy and delicious layered parfait made with homemade blueberry jam, blueberry chia pudding, and dairy free yogurt. Happy August, everyone! Hope you’re all having a fabulous summer. Only a few weeks left before school starts and we go back to early mornings and regular schedules. The best thing about working from home is that I get to have a real summer with my family. It’s been super hot here in Northern California, and we’ve spent the summer swimming, playing, and being with friends and family. With the heat, I’ve been spending less time in the kitchen. Quick and easy meals are what’s on the menu. Too hot to cook most days. One of our new favorite breakfast foods is to make parfaits layered with all the good things. We’ve been up to our ears in summer berries and fruit, making easy homemade jams, chia puddings, and smoothies. And since I’m currently obsessed with everything blueberry, we’ve been eating this blueberry breakfast parfait like it’s going out of style. Layer #2 is a blueberry chia pudding that takes about 3 minutes to throw together the night before. Layer #3 is plain dairy free yogurt. Layer #4 is all the optional toppings. We went for almond butter, more blueberry jam, fresh blueberries, pumpkin seeds, and chia seeds. All healthy, real food ingredients. Totally dairy and gluten free. I’ve been trying out different dairy free yogurts recently. This parfait was made with a store-bought yogurt. I think I may need to experiment with making my own. So basically with a few minutes of prep the night before, you get to enjoy this work of art for breakfast. Doesn’t it just scream “happiness in a jar”? Enjoy these last beautiful days of summer. Tell your people you love them. Smile more. Prepare chia pudding by processing milk and blueberries in a blender until creamy smooth. Whisk in chia seeds and pour into glass jar. ( I use a quart size wide mouth mason jar.) Refrigerate for at least 4 hours or overnight. 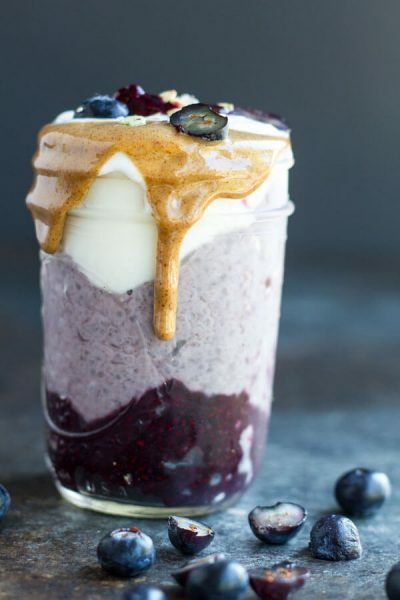 To assemble parfaits, add 2 tablespoons of blueberry chia pudding to small glass jar. 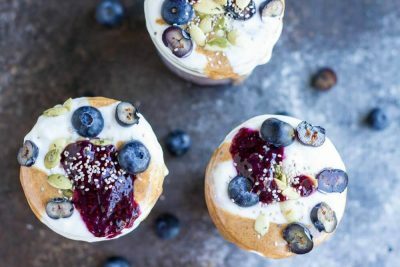 Layer in blueberry chia pudding and yogurt. Top with almond butter, chia seeds, pumpkin seeds, fresh berries, and extra jam. Enjoy!